The Midbow Apartment is a first floor flat, located in a historic listed Victorian tenement. Large windows overlook the bustling cobbled street and the colourful facades of one of Edinburgh's most picturesque streets. Double Bedroom with superking (6' wide) solid teak four-poster bed, wardrobe, chest of drawers and dressing table. Living Room with unique Clie sofa bunk-bed, making two full size adult bunks, plus a vintage teak and leather Danish armchair and antique desk. Bang and Olufsen TV/DVD/CD player with Freeview and a selection of DVDs, and Roku box with iPlayer and other catchup services. Please note we cannot allow pets or smoking. 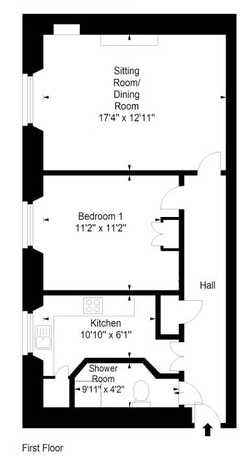 Here's the layout of the apartment.